For the first time ever, the Google Play Store served more app downloads in a quarter than the Apple App Store, about 10% more according to App Annie. However, the iOS store still brings in 2.3x more revenue than the Google реpository. The main moneymakers in both were games, accounting for 40% of downloads during Q2 of this year. Games accounted for 75% of the revenue generated by the App Store and 80% of the revenue by the Play Store. It’s interesting to see how the two platforms differ in the Top 5 most downloaded app categories. For iOS users, Entertainment, Photo & Video, Lifestyle and Utilities were the most important (after games), while Android users pushed Communication to #2, above Tools, Entertainment and Social. Social networking apps made a lot of money, getting into Top 5 on both platforms. But while the Apple store had the Music category shoot up 3 places, it was Travel & Local that climbed in the Google store. 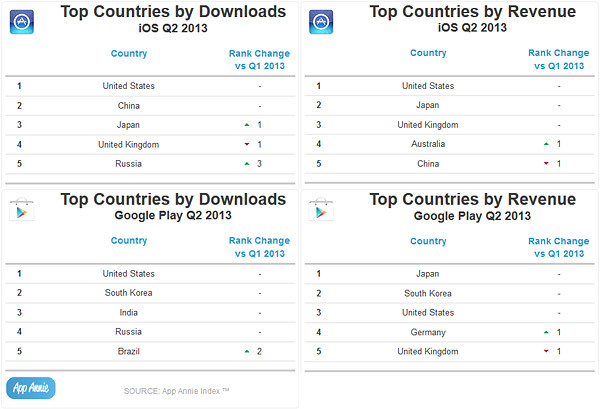 How different countries placed in the top downloads and top revenue is also telling. The US is on top in all but revenue from the Play Store. Russia is the only other country to be in the Top 5 for app downloads from the App Store and the Play Store. Interestingly, China is #2 by downloads and #5 by revenue for the App Store, even though the country is dominated by third-party app stores (yes, for jailbroken iGadgets). The US and Japan (at #2 by revenue) accounted for 40% of the revenue. Japan spends a lot of money to the Play Store too – in fact it’s at the top, even though it isn’t in the Top 5 for most downloads. South Korea and the US are second and third respectively, with these top 3 making up 70% of the Play Store revenue.